If you're looking for something a bit 'off the beaten track', you could do worse than this 1930 novel. It's something of a cult classic, though I hadn't heard of Houghton at all until recently. A lonely man is employed as secretary to the elusive Jonathan Scrivener, and becomes acquainted with the man's diverse circle of friends; in the process he learns a great deal about himself, but frustratingly little about his employer. I Am Jonathan Scrivener is a philosophical novel, a psychological examination of character, and a mystery, and it's also full of social commentary which makes it a fascinating portrait of London in the 1920s. I read these two volumes of Aickman stories in quick succession, and found The Wine-Dark Sea slightly more successful than The Unsettled Dust, though both contain some fantastic, memorable stories: my favourites were 'The Trains', 'Your Tiny Hand is Frozen' and 'Never Visit Venice' from the former, and 'No Stronger Than a Flower', 'The Cicerones' and 'Ravissante' from the latter. 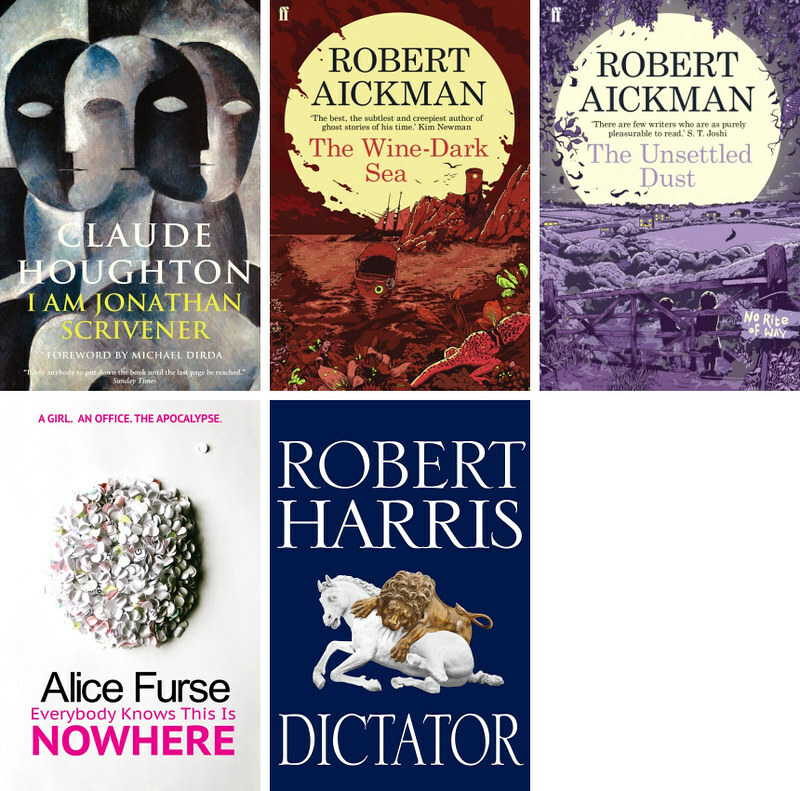 Aickman's weird fiction frequently creates an atmosphere so uncomfortable it is difficult to keep reading, so with both collections, the stories that were technically the best and most brilliant were also among those I enjoyed the least. I'm glad to have expanded my knowledge of Aickman's oeuvre, and his tales are certainly appropriate for the ghost story season, but I think it might be a while before I read any more. I loved this, and I'm amazed it hasn't become more popular - it certainly deserves to be a big hit. It's one of those stories in which ordinary life is observed and documented and not much really happens, but it feels at once very important for right now and completely timeless. The characters and dialogue are fantastic, it's funny, it has real heart... Enthusiastically recommended. The final book in Harris's Cicero trilogy, following Imperium (2006) and Lustrum (2009). It's an action-packed volume, covering a long stretch of Cicero's life as well as some of the most important political and military events in Roman history. But it's also curiously subdued, and I didn't find it quite as exciting as the other two. I think this is mainly just due to the shift in my tastes since I read them, and I'm still pleased to have seen this epic story through to the end. October was a slow reading month. I haven't felt particularly inspired and have constantly despaired at my own lack of enthusiasm and pace... but I guess that's just the way it goes sometimes. (I also devoted chunks of my time to Garth Risk Hallberg's City on Fire, which I still haven't finished.) With the exception of the Aickman collections, I also totally failed at reading any significant number of ghost stories before Halloween. I can only hope that November is more productive!